Woodstock, NY: Overlook Press, 2000; $35.00 hardcover; 591 pp. This review originally appeared in the October 2000 issue (#146) of The New York Review of Science Fiction. Because most of the genre’s classics were written well before my adolescence, I often bemoan the fact that many are out of print, making it hard for me to track them down and read them for myself. Luckily, however, the task is not impossible. Often, with a little perseverance, I can find these novels used, and occasionally they come back into print, making my search easier. When I do find them, I sometimes find myself with contradictory reactions to them. For example, after reading Slan by A. E. van Vogt, I understood intellectually its importance to the genre and its popularity when it first arrived, but I couldn’t fathom how someone reading the novel today for the first time could think it a great example of sf. In fact, I found much of the writing so outright laughable that I was left wondering why it was necessary to bring the novel back into print. I didn’t have that reaction when I read the new Overlook Press reissue of James Blish’s Cities in Flight. I was able to appreciate Cities, unlike Slan, as both a classic and a fun-to-read book. For those who might not know the story (those who do can skip ahead to the next paragraph), Cities is a tetralogy of fix-up novels that chronicle the stories of nomadic cities outfitted with antigravity devices known as spindizzies that left the Earth and now search the galaxy for work to sustain their existences. In particular, the stories focus on New York City, its leaders, and the tribulations that they face as they roam from star to star. The stories present a cyclical view of history that mirrors, but does not fully parallel, the general American experience during the Great Depression. Reading Cities today, it is easy to see why it obtained its classic status. Despite the specter of severe social problems looming both in the forefront and in the background, there is a positive outlook on the future, one that isn’t seen often in sf anymore. Space truly is an open frontier, filled with challenges and adventures for those with the skills and desire to meet them. Virtually any problem is solvable with the correct effort and the right amount of science. Technical marvels such as instantaneous interstellar communication, faster-than-light travel, and drugs that virtually stop the aging process are commonplace. All of these elements combine to make the galaxy a truly exciting playground. Yet, these elements in themselves do not make good reading. If they did, I would have found Slan highly enjoyable. The joy in reading Cities comes from the stories themselves. 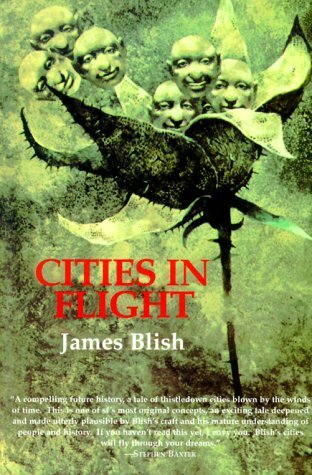 While reading Cities does induce feelings of awe at its scale, Blish is not out to dazzle us with his vision. Instead, the details actually hold the greatest importance; all the technological thrills are nothing more than plot devices and are not where our focus should center. In fact, the techno babble is sometimes dull enough to make you consider skipping over it as you continue reading. Instead, we are supposed to sit back and watch how the characters, particularly Amalfi, find solutions to the perilous situations they find themselves in. Thankfully, the Macguffins that often plague adventure fiction are absent from Cities. On top of this, there is an element of enjoyment in reading Cities today that probably didn’t exist when the stories were first written. This vision of this future paradoxically also acts as a literary trek into the past. Due to the nature of publishing today, fix-ups such as Cities just aren’t written anymore, and unlike Cities, many of those that were written feel more like short stories with a thematic link than a unified novel (Asimov’s first Foundation novel is a good example of this). Instead, despite an episodic nature that is almost unavoidable given the pulp origins, the four novels that make up Cities are woven together more smoothly than other fix-up classics. Another element of enjoyment possible only decades after the original writing is the mention of devices such as mimeograph machines, vacuum tubes, and slide rules–items that don’t even register in the consciousness of people today, let alone two millennia into the future. While these already obsolete devices stick out like the proverbial sore thumb and show the age of the book, they also serve as a reminder that the future is never fully predictable, that there are changes that no one can anticipate on any level. Yet, with all that is going for Cities, it may be something better read in parts rather than digested all in one sitting. It suffers from a major weakness that plagues many sf series published as separate volumes, often years apart, throughout the decades: the insertion of back story at the beginning of each book to bring the reader back up to speed. With the behemoth size of today’s novels, this now might be a necessity. However, considering that anyone of Kim Stanley Robinson’s Mars books is longer than the combined length of the four books that make up Cities, you can see how the continuing reminders of previous events can get a little irritating. It’s a shame that Blish never revised these novels for collected publication. Aside from that minor quibble, Cities is a thoroughly enjoyable classic that has aged well over the years. Regardless of when your golden age was, this book will entertain as it simultaneously takes you both forward and backward in time. Furthermore, while the binding and cover shouldn’t make a difference as to whether or not you should read a particular book, this hardcover release of Cities provides today’s collectors with an opportunity to get a copy with some permanence and durability. This entry was posted in Book Review, James Blish, Matthew Appleton. Bookmark the permalink.